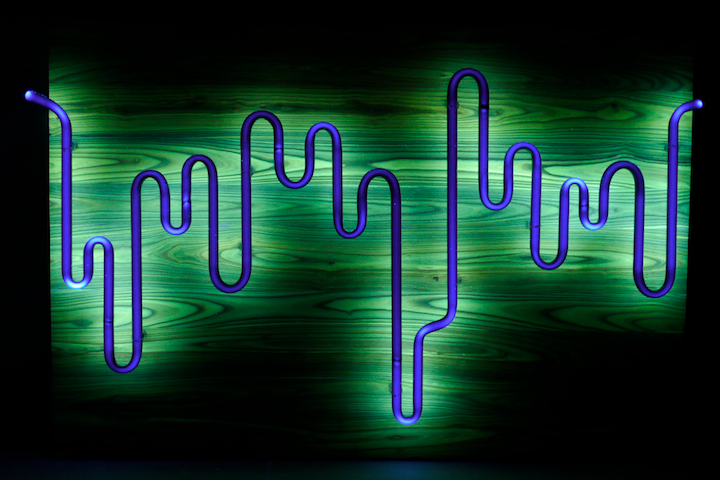 This is the first fluorescent wood light sculpture ever created. This experimental project takes advantage of an esoteric property of only a few known wood species: Fluorescence under UV blacklight. Under UV, Staghorn Sumac, which rarely grows large enough to make a panel of this size (2' x 3'), glows in bright yellows, greens and blues with an occasional hint of purple. Electricity excites argon gas molecules encapsulated in a specially coated glass tube (a solid/liquid hybrid) to emit radiation in the ultraviolet spectrum that excites molecules in the kiln-dried wood, causing them to glow in the visible spectrum. The UV glass tube was bent in a way to suggest dripping, emphasizing the flexible boundary between material states. This video documents the first prototype tube, as realized by Shauna Peterson of Peterson Neon. Link. Published on December 01, 2010 by Michael Turri.